Draft: 1 Ft. 9 ins. Construction: Double diagonal Mahogany planked skin with waterproof membrane sandwiched in between. 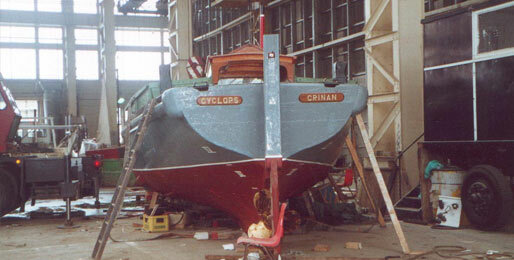 Cyclops was obtained from the Crinan Harbour Authority where she had been used as mooring buoy tender / work boat. Prior to this she was used as a small ferry carrying people, stores and livestock between the Hebridian islands. 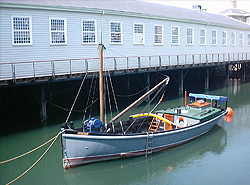 Cylops was built in 1915 in Portsmouth Dockyard in Number 6 Boat House (located at the end of the Mast Pond, Currently housing the’’ Action Stations’’ project). 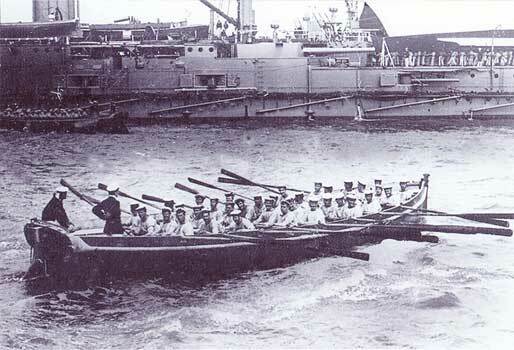 She was a 42 Ft. rowing launch to the Battleship HMS Royal Sovereign (1915) used for carrying supplies out to the ship. She would have been manned by 38 seamen two to an oar operating from nine thwarts. The positions of the stations are still visible today. Cyclops currently is fitted with a diesel engine from a Combine Harvester as she was when in use as a ferry and harbour mooring boat, Cyclops will be maintained in her present configuration for potential use as a Property Trust Work boat. At the present time there are no plans to carry out changes to revert her to her original state.